Xarelto is a popular blood-thinner produced jointly by Bayer Health Care and Janssen Pharmaceuticals (a subsidiary of Johnson & Johnson). Along with Pradaxa and Eliquis, it is one of a new generation of blood thinners that pharmaceutical companies have commended to the medical community as requiring less testing and monitoring than drugs prescribed in the past for stroke prevention. Xarelto has risen to become the most successful of the new drugs introduced into the estimated $10 billion U.S. market for blood thinners. Unfortunately, like the other blood thinners in this group, Xarelto also has an internal bleeding risk for which there is currently no effective antidote. Thousands of adverse event reports regarding bleeding incidents, including reports of fatal complications, have been filed with the FDA over this widely used medication. Xarelto lawyers have begun to file lawsuits against the pharmaceutical company for its alleged failure to warn potential patients regarding this grave risk. What is Xarelto and how does it work? 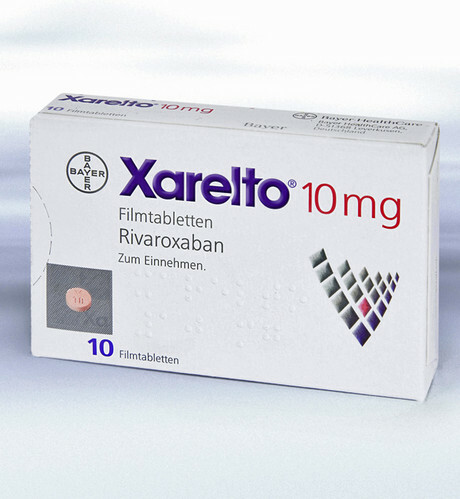 Xarelto is the generic name for the drug Rivaroxaban, an anticoagulant (or blood thinner). It is a “direct thrombin inhibitor” (or DTI) which blocks the formation of thrombin, a blood clotting factor. Doctors prescribe Xeralto and other DTIs to patients at risk for blood clot formation and stroke. The precise mechanism for blocking thrombin in each DTI differs. Whereas Pradaxa, another well-known brand of DTI, blocks thrombin production directly, Xeralto is actually the first of its kind to actually inhibit the production of a protein called Factor Xa, involved in the formation of thrombin. DTIs like Xarelto were introduced as an alternative to an older blood thinner called warfarin (marketed as Coumadin or Jantoven). Warfarin had been the standard anti-coagulant prescribed by doctors for decades; however, it required frequent blood tests and monitoring of diet and exercise in order to be safe and effective. Doctors adjusted the dosage of the drug in coordination with regular appraisals of the patient’s status. The FDA approved Pradaxa, the first of the DTIs, in 2010. Pradaxa was marketed with an enticing feature for both patients and doctors: unlike warfarin, it did not require the vigilant monitoring that brought patients to the doctor’s office on a regular basis. It was taken orally in a fixed dosage with no blood tests or strict controls on diet. Pradaxa was quickly embraced and sales took off. Even in the midst of controversy and lawsuits related to bleeding risk claims, Pradaxa significantly bolstered the 2013 revenue of its German-based manufacturer, Boehringer Ingelheim. Xarelto was introduced late in 2011 as a Pradaxa competitor. It was even more successful in the U.S. market than Pradaxa, quickly rising to the number one sales position among blood thinners in this country, a position it holds currently. Global sales estimates for the drug in 2013 are $1.3 billion. Its “multi-purpose” nature has allowed the drug to surpass not only Pradaxa but also Eliquis, introduced more recently by Bristol-Myers Squibb, in the drug market. Unfortunately, Xarelto carries some serious side effects which some of the thousands of patients who have been prescribed the drug have already experienced. Whereas warfarin also carried an elevated risk of internal bleeding, the risk of abdominal bleeding is actually higher with Xarelto. Spinal/epidural hematomas (in which blood pools outside of blood vessels in the area of the spinal cord) can result in permanent paralysis. The FDA has mandated its most serious (“black box”) warning label be added to Xarelto’s packaging. The crucial difference between warfarin and the new generation of anticoagulants is that warfarin had an effective reversal agent to stop a bleeding event: vitamin K. And, unfortunately, Xarelto and other DTIs do not. This means that any bleeding events that befall patients taking Xarelto could be fatal. By the end of the 2012 fiscal year, there had been 2081 total serious adverse event (SAE) reports (151 involving fatal events) sent to the FDA regarding Xarelto bleeding side effects. The quarterly report for the Institution for Safe Medication Practices (ISMP), issued on May 7, 2014, has presented data showing that Xarelto has surpassed its competitor Pradaxa not only in sales but also in SAEs, data that the ISMP attributes to the fact that Xarelto is now prescribed approximately twice as often as Pradaxa at this time. In addition to mandating warning labels regarding the risks of internal bleeding and spinal hematoma cited above, the FDA also perceived Xarelto’s bleeding risk to be grave enough that it censured Bayer for downplaying this risk in advertising in June of 2013. In spring of the same year, the FDA also rejected requests to expand the indications for the drug further, to include prevention of heart attack and stroke among patients with existing risks of heart problems, citing problems with uncontrolled bleeding. The FDA has now rejected three such attempts to increase the recommended usages for the drug for this reason. Unfortunately, as noted above, there is no reversal agent and it can take 24 hours to flush the DTIs out of a patient’s system while treating a bleeding episode. Physicians still lack a clear protocol for dealing with serious DTI-induced internal bleeding events. Rapid intervention may save the patient’s life, though more vulnerable members of the population (such as elderly patients) are at a higher risk for fatal outcomes. The first lawsuits concerning Xarelto were reported in the German press in June of 2014. Though there were only about 10 at the time, the number of lawsuits filed has slowly increased over the summer. Given the scope of drug sales since Xarelto was approved and the number of increasing incident reports, it seems likely that this trend will only accelerate. Boehringer Ingelheim resolved thousands of claims regarding similar side effects for its drug Pradaxa through a $650 million settlement. As in the Pradaxa cases, Xarelto plaintiffs claim that the defendant produced a defective drug and continued to market and promote it even after the risks involved were clear, and that they failed to warn potential consumers of these risks. Patients who have suffered bleeding events in connection with their use of the drug may be eligible to file a Xarelto lawsuit to seek compensation for medical expenses, expenses associated with long-term complications, lost wages or earning potential, and pain and suffering. Next of kin may also be eligible to file wrongful death lawsuits in connection to loved ones who died as a result of such bleeding events.